decline] as the environmental cause to my manic depressive illness. Bi-polar is the politically correct term now," says Littleton. From his own perspective, Ken seems to see himself as being somehow persecuted my [WW] the Skakel family. 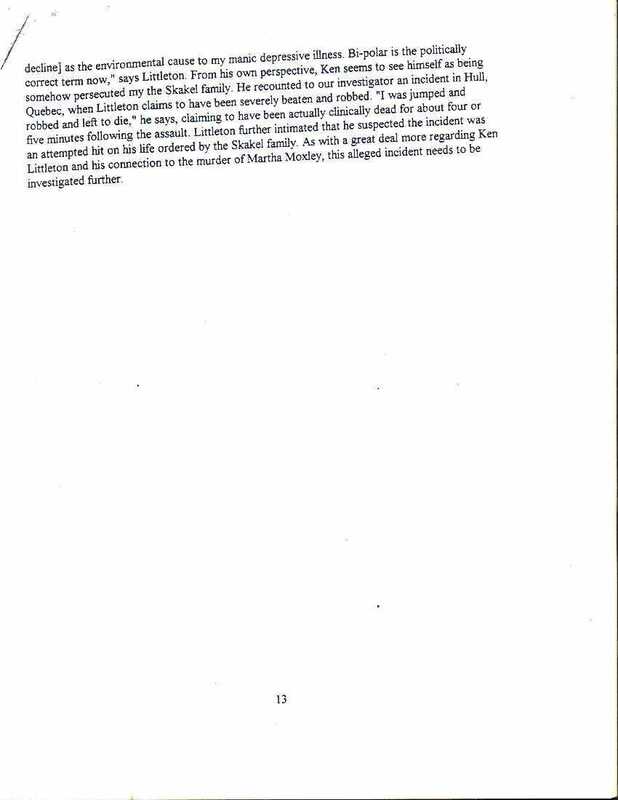 He recounted to our investigator an incident in Hull, Quebec, when Littleton claims to have been severely beaten and robbed. "I was jumped and robbed and left to die," he says, claiming to have actually been clinically dead for about four or five minutes following the assault. Littleton further intimated that he suspected the incident was an attempted hit on his life ordered by the Skakel family. As with a great deal more regarding Ken Littleton and his connection to the murder of Martha Moxley, this alleged incident needs to be investigated further.